On 27-30 November 2017, representatives of all eleven CBSS member states, gathered in Sigtuna (Sweden), to take part in the Baltic Leadership Programme in Civil Security. All 25 participants of the Programme have been nominated by their respective civil protection and law enforcement organisations, because of their leadership potential. This year, the course has been focused on the implementation of the Sendai Framework for Disaster Risk Reduction. The three main features of the programme were: building leadership abilities, creating a shared security culture, and strengthening regional cooperation. The overall aim of the Programme is to enhance the capacity of civil protection and law enforcement organisations by engaging experts, who hold key strategic leadership positions in, at the local, regional and national levels. The Programme offers a unique opportunity for the participants to share experiences and best practices among peers, acquire new knowledge and enhance leadership skills through the combination of theory and practice. The participation in the course also increases the institutional knowledge and strengthens the ties between the agencies playing the central role in the crisis management in the BSR. 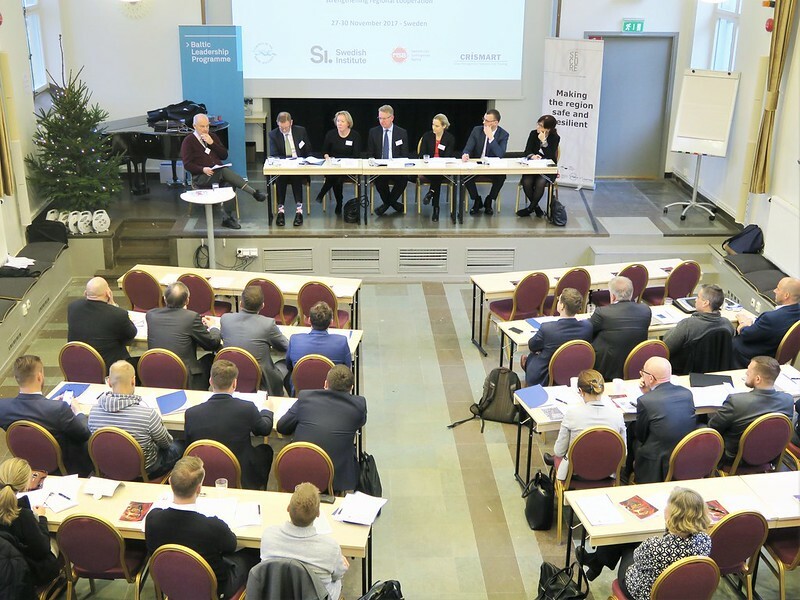 The Baltic Leadership Programme was planned and organised by the EUSBSR Policy Area Secure coordination teams at the CBSS Secretariat and the Swedish Civil Contingencies Agency (MSB), and the Swedish Defence University, with funding provided by the Swedish Institute (SI). The programme was opened by a high-level panel, which presented perspectives on strategic leadership, and strategic visions related to civil security. The participants in the high-level panel were: Ambassador Maira Mora, Director General of the CBSS Secretariat; Mr Kurt Bratteby, Director General of the Department for International Relations at the Swedish Institute; Mr Nils Svartz, Acting Director General at the Swedish Civil Contingencies Agency (MSB); Ms Sofia Wennerstrand, Swedish National Coordinator for the EU Strategy for the Baltic Sea Region (EUSBSR) at the EU Secretariat of the Prime Minister’s Office in Stockholm; Ms Joanna Wojtkowska, Head of Northern Europe Unit in the European Policy Department, in the Ministry of Foreign Affairs in Poland, and the Polish National Coordinator for the EU Strategy for the Baltic Sea Region (EUSBSR); and Mr Dimitrijs Trofimovs, State Secretary of the Ministry of Interior, Latvia. Ambassador Mora highlighted the relevance of transnational and cross-sectoral cooperation in the area of civil security and disaster risk reduction: “The aim of the CBSS, through the coordination of the Policy Area Secure, is to constitute an information hub for stakeholders dealing with safety and security issues in the Baltic Sea Region”. During the intensive 4-days programme, the participants had an opportunity to meet and learn from some of the most renowned experts in crisis management in Europe and the world. Ms Paola Albrito, Chief of the Regional Office for Europe and Central Asia at the United Nations Office for Disaster Risk Reduction (UNISDR), gave a keynote speech on Disaster Risk Reduction and the UN Sendai Framework for Disaster Risk Reduction, in which she emphasized the importance to “think globally – but act locally”. Thereafter, Ms. Albrito moderated the panel discussion on good examples in addressing cooperation initiatives utilizing multi-stakeholder engagement at all levels. Mr. Craig Fugate, the former Director of the U.S. Federal Emergency Management Agency (FEMA), gave a lecture on the third day or the course, where he illustrated common mistakes in emergency management. “A mistake is that we only plan for what we are capable of responding to”, and “we only exercise to success”, and “rarely make unplanned surprise exercises”, Mr. Fugate explained. During the second part of the course, Mr. Fredrik Bynander, Associate Professor and Research Director at CRiSMART, emphasized that “leadership is a collective function”, and thereafter guided the participants through a hands-on scenario-based exercise. In this group simulation, the participants confronted a critical situation escalating into a potential large-scale crisis in the whole Baltic Sea Region. Working together, different teams tested their crisis management skills, producing recommendations for the politicians while addressing the public through media. Sofie Ivarsson, Executive Officer for Exercises, Swedish Civil Contingencies Agency (MSB).